Woohoo! Sabrina's been keeping busy this week - her brother is at basketball camp and out of her hair, so she has had a chance to exercise a little creative freedom in the kitchen. She's been dying to make a layered Jello mold. So yesterday, we picked up an industrial sized tub of Cool Whip from Smart and Final, and today she performed a little gelatin magic. Now the only problem we ran into was that I've never made a gelatin mold before. So I hit the Jello website and found a recipe that was exactly what we were looking for. After mixing in the Cool Whip, she poured the mixture in the pan - we used a bundt type cake pan, it was the only one I had that was large enough to accommodate both layers. 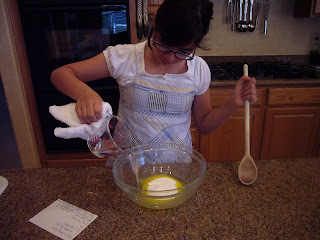 I could have used a 9 x 13 pan, but Sabrina had her eye on the flower shaped pan. 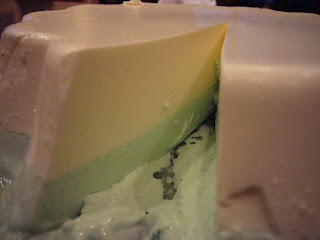 After the lemon layer chilled, she repeated the steps with the lime jello. Unfortunately, we forgot about the salad tonight so we broke it out of the mold while we were cleaning up from dinner. The verdict? 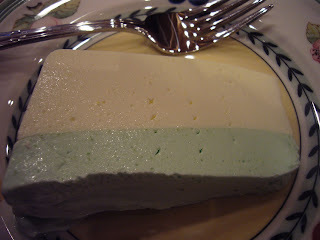 Sabrina here: It was really good - lemony and limey. I'd like to try and make it with different flavors. I thought it was outstanding. Perfect for the super hot weather. We're waiting for David to try it, his mother used to make a salad similar to this so we are anxious for his opinion. Dissolve Jello in boiling water. Add enough ice cubes to cold water to measure 1 cup. Add to Jello and stir until ice is melted and mixture is thickened. 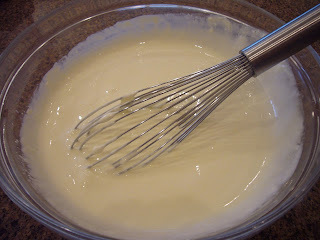 Whisk in Cool Whip until well blended. Pour into greased mold and refrigerate until set and firm, about 2 hours. 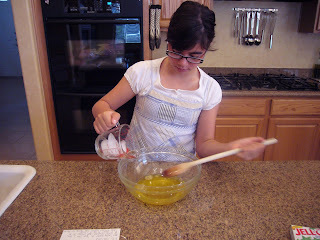 Repeat process with another flavor Jello, then carefully pour over top of first layer. Chill for at least 4 hours.